NEW YORK, April 5, 2019 -- ASCAP has announced an illustrious group of new panelists for the 2019 “I Create Music” EXPO, with industry leaders represented across a diverse array of music genres. Wyclef Jean will be among the music creators on hand to provide knowledge, guidance and support to EXPO attendees. He will perform and share what he’s learned in his GRAMMY-winning, chart-topping career as a solo artist and member of the groundbreaking hip-hop trio Fugees. Golden Globe-nominated Troye Sivan collaborator Leland will lead his fellow songwriters in a cross-genre roundtable on the craft. Songwriters Hall of Fame inductee Desmond Child (“Livin’ on a Prayer,” “Dude (Looks Like a Lady)”) will host an intimate master class with a set of handpicked aspiring songwriters. Current Songwriters Hall of Fame electee Jack Tempchin will share his hits like The Eagles’ “Peaceful Easy Feeling” and “Already Gone” at the EXPO “Center Stage” Showcase. Composers Joel Beckerman (Super Bowl and CBS This Morning theme songs) and David Vanacore (Survivor, Big Brother) will provide expert insight on how music creators can get what they deserve out of their film/TV music deals. Music creators at EXPO will also have the chance to get feedback on their original music from stars like Sondre Lerche, who has successfully traversed the worlds of pop, rock, jazz and film music. 2019’s fresh slate of “I Create Music” EXPO programming will focus on collaboration, networking, mentorship and helping conference attendees reach for the next stage of their careers. Newly announced panels center on up-to-the-minute topics like the rise of emo rap and the global growth of country music, as well as hot tips from industry experts on topics like the evolution of music publicity in the playlist age. This is in addition to previously-announced highlights such as Lee Ann Womack and Oscar-winning “Shallow” co-writer Anthony Rossomando, who are confirmed for the annual “We Create Music” panel, and the “Ariana Grande's Songwriting Dream Team” panel featuring her close collaborators Victoria Monét, Tommy Brown and Charles "Scootie" Anderson and moderated by video director Hannah Lux Davis (“7 rings,” “thank u, next”). For the full 2019 ASCAP “I Create Music” EXPO schedule to date (with more announcements to come soon), click here: https://expo.ascap.com/agenda. For tickets and more information about the 14th annual ASCAP “I Create Music” EXPO visit: https://www.ascap.com/expo. 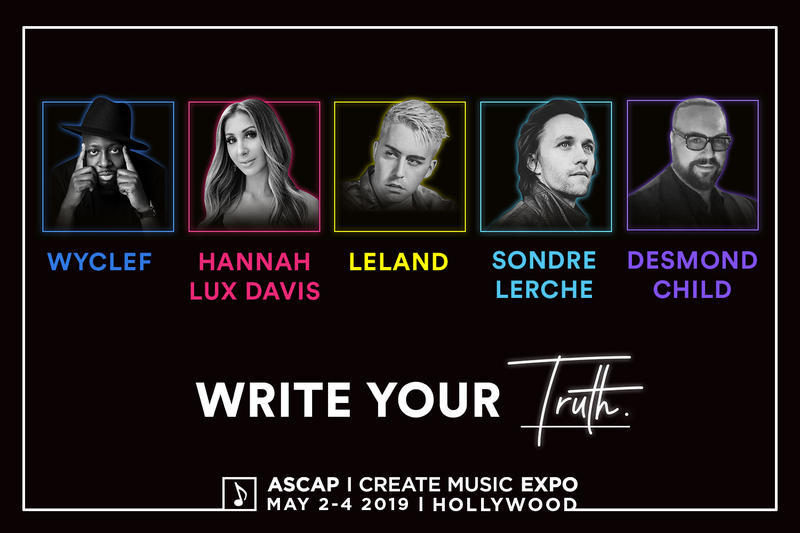 This Billboard-sponsored panel will bring together some of today's most respected songwriters and composers to uncover the universal truths that bind them together. Featured panelists include A Star Is Born songwriter Anthony Rossomando, Grammy/CMA/ACM winner Lee Ann Womack and Pinar Toprak, the first woman to score a big-budget Marvel superhero film (Captain Marvel). This popular panel serves as an “ASCAP EXPO 101” rundown of the many opportunities available at EXPO from those who have been there before. This year's edition includes musicians who’ve had their careers changed by previous EXPO visits, such as producer J. Rhodes (The Game, Talib Kweli, Rick Ross), composer Schpilkas (who wrote music for trailers for the film Get Out, video game Call of Duty and featured music for NIKE’s Vapen Sessions snowboard videos) and The Wildcardz, a production duo who are veterans of ASCAP's She Is The Music songwriting camp, and recently worked with R&B singer Justin Park and emerging pop singer-songwriter Carly Paige. A deep dive into the negotiations behind a film/TV music deal with those who have reached the highest level of the field - including Joel Beckerman (Super Bowl and CBS This Morning theme songs) and David Vanacore (Survivor, Big Brother) - along with NBC’s Head of Music Alicen Schneider and Brad Shenfeld, a legal expert on film and TV music. They’ll help EXPO attendees differentiate between what’s standard practice and the sneaky fine print composers should watch out for. The six-time ASCAP Country Songwriter of the Year and writer of 39 #1 hits will share the secrets that have made him a go-to collaborator for Nashville’s biggest stars, including Carrie Underwood, Luke Bryan, Jason Aldean and Thomas Rhett. "I’ve always loved to mentor and coach songwriters — to actually be there and offer feedback, to offer advice that may help them cut the time it takes to succeed,” says Gorley. Some of music’s biggest songwriters will perform their best-loved songs in an intimate, in-the-round setting on the first evening of EXPO – including Lee Ann Womack and Jack Tempchin (The Eagles’ “Peaceful Easy Feeling,” “Already Gone” and “Somebody”). The [istandard] Producer & Rapper Showcase will feature “I Create Music” EXPO attendees (both producers and rappers) performing their best beats and bars for a selection of hip-hop’s most influential figures, including producer Amadeus (Chris Brown, Fabolous, Trey Songz). Master “song whisperer” Darrell Brown returns for another marathon session of spontaneous, high-energy song feedback. This hit writer-producer will help EXPO attendees with their original songs – figuring out what’s great about them, what could use some work and how to rebuild them better than ever. A team of industry superstars - Dominique Dunn (Roc Nation), Jennifer Drake (Sony/ATV), Ericka Coulter (Epic) and Ashley Calhoun (Pulse Music Group) - will help demystify the world of A&R and offer their unique perspectives on how women experience the music business. Topics covered will include how A&R execs work with music creators, and how budding talent can catch their attention. With the abundance of chart-topping crossover success that Spanish language music has experienced, a star-studded panel of Latin voices will discuss this moment in Latin music, the forces behind it and what the future holds for Latinx creators in the new music landscape. Panelists include reigning Latin Grammy Producer of the Year Linda Briceño (aka Ella Bric), two-time ASCAP Latin Songwriter of the Year Claudia Brant, two-time Grammy-winning producers Play-N-Skillz (behind Daddy Yankee's recent #1 Billboard Latin Airplay song "Con Calma" ft. Snow), Romeo Santos co-writer and musical director Joaquin Diaz and DJ Ali Stone, who has opened for Justin Bieber. ASCAP EXPO's ultimate new artist showcase is back for another year. EXPO attendees will have the chance to perform their original music in front of a star-studded panel of judges, who will provide valuable insights and choose their favorite songs until one winner remains. “She Rocks” is a night of music and empowerment in the EXPO community featuring some very talented women in music, drink specials and gear giveaways at Musicians Institute new venue Live House. A powwow of Ariana Grande's closest confidants and co-writers will take EXPO attendees through the process of crafting one of her unique hits, and reveal how they became a trusted colleague of this global pop icon. The panel will feature Ariana’s recent “Monopoly” collaborator Victoria Monét, as well as thank u, next and Sweetener producers Tommy Brown and Charles “Scootie” Anderson. Hannah Lux Davis, who directed the instant-classic music videos for “Thank U, Next” and “7 Rings,” will moderate. LA Times music critic Randall Roberts, motormouthmedia’s Judy Miller Silverman and others will explore the impact of playlists and social media on music journalism, as well as the do’s and don’ts for pitching your music and the factors behind going viral. To close out this year’s EXPO, a killer lineup of songwriters from across the genre spectrum – including 2019 GRAMMY Best R&B Song winner Joelle James (Ella Mai’s “Boo’d Up”), CMA and ACM Award winner Jon Nite and chart-topping Zedd collaborator Matthew Koma - will play and tell the stories behind their hits in an “in-the-round” setting.